Szeki Chan's presence alone is as equally warm and charming as her toothy grin. We met Chan and her assistant Shirley Cai back in LA a couple of years ago when they introduced us to their extensive collection of thoughtful ready-to-wear. I vividly remember Chan thoroughly and passionately explaining her thought process behind each garment, noting particular construction details and significant fabric choices for every individual piece. Her presentation was heartfelt and delivered with such elegance and supreme intelligence — our brief meeting stuck with me for weeks to come. For a designer that has been creating beautiful, practical clothing for ten years, such energy and steadfast passion is not the norm. Inevitably, people grow tired of routine and sameness and become mechanical in their craft, yet Chan is the exception. With a genuine, deep-hearted desire to serve her growing clientele, and an overall sanguine outlook and attitude about the future of her line, Chan continues to magnetize and mystify through a true love of craft designated for the people, with a little help from friends, family, and community. We thought ‘7115’ represented the month, day, and year of a special event in your life, but that’s actually not the case at all. What is the backstory behind the brand name? I’m originally from Hong Kong. There, residents have identification cards where their family names are represented in numerals – a Chinese Telegraph Code. The number 7115 stands for my family name ‘Chan’. Over the years the numerals have come to represent our mission. 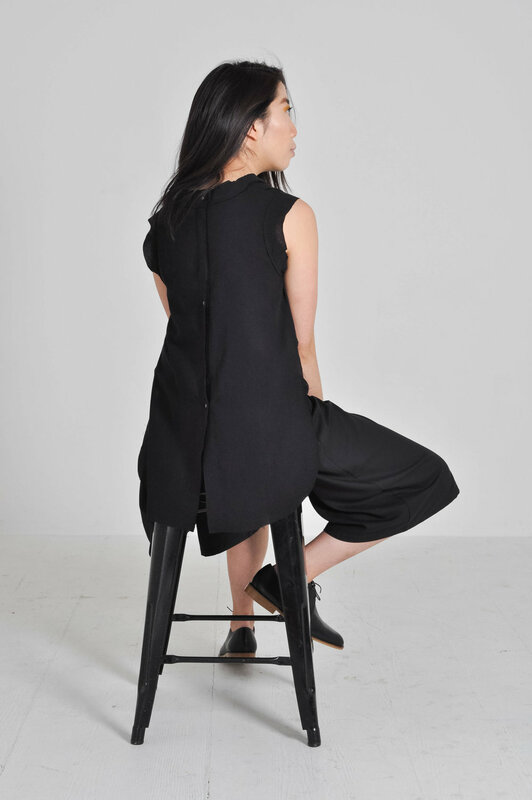 When I started 7115, I set out to make everyday garments that works hard for our customer — clothing that you could count to wear day in and day out, day to night, never get sick of, and that would serve you for years to come. My team and I try to achieve that by better our designs, our materials and craftsmanship in every chance we get and making sure they are attainable. Congratulations on being a decade old! Starting a company for the first time can be daunting. Can you recall what the first few years felt like in comparison to where you are today? The first couple of years were the most memorable — very hard but very exciting. I started this company with only two thousand dollars that I made from selling my handmade jewelry on the street, so since the beginning I was aware that I needed to be very resourceful. I needed to be able to make things work with in my skill set and maybe learn a hold bunch of new skills along the way. I was building something from nothing, everything was new and everything was a milestone. It was a very energizing period. I think the most challenging times were between years 3-6. These were the most grinding years. Like most business owners, I was eager for growth and the mini victory that I had from the first couple of years had lead me to set some unrealistic goals and expectations. As a result there were a lot of let downs when things didn’t meet my expectations, but looking back, those years shaped what 7115 is today. Mistakes needed to be made for a clearer vision and I am relieved I was able to get pass those tougher years. For the past 2-3 years, 7115 has been a gift to me. I am lucky to have an incredible team behind me, from production to sales, we all work hard together like a well-oiled machine. I am not saying things are easy now, because every stage brings a different set of challenges — much like parenting a child — but the stability certainly brought some calm to the business and that has enabled me to make better and smarter decisions for 7115. How do your customers influence your work during ideation sessions each season? Our customers have always been the backbone of 7115. I set out to make everyday garments that work hard for our customers, so their feedback (what they like and dislike) is the root of our research and development. I still work the floor of our LES location on the weekends just to stay close and hands on with our customers’ needs. I think that has helped tremendously in terms of my design direction. You have a store in LES and another store in Williamsburg. Do you think each location has a distinct flavor and/or audience type specific to each neighborhood? I think the LES store serves a wider spectrum of customers, mainly because of its location and the diversity of the neighborhood. I love working there. I get to meet and speak with all kinds of personalities. 7115 and I technically grew up there (I’ve lived and work in the neighborhood since my early 20s). It feels like home to and I am deeply connected to that community. In turn, the store has a modest and homey vibe. The Williamsburg store is a little bigger and more experimental. We renovated our store last year to create a space that was resourceful and creative to reflect the kind of community over there. They’re more open to different concepts so I see that demographic as a great launching pad for some of my newer ideas, where I test things out before we figure out how to roll it out completely to the rest of our audience. "Our customers have always been the backbone of 7115. I set out to make everyday garments that work hard for our customers, so their feedback (what they like and dislike) is the root of our research and development." You’ve performed live on stage for thousands of people, represented a clothing brand flawlessly to many loyal followers, and make brief cameos on your IG feed season after season. What does stage fright look like to you/does it exist? They are all very different experiences in nature. Stage fright definitely exists in different forms and degrees to me. I am most nervous when it comes to presenting; verbal communication is a gift that I don't have. I would avoid public speaking at all costs. Performing however is easier to me at the time (maybe not now since I am rusty). I don't have to convince audience with words, I only the need to be good in the performance itself. What’s your favorite video floating around the web right now from your past life as a pop star in China? Feel free to send all the links. All of them. None of them are particularly worth watching if you ask me...ha....! I like to do create work during the mid-day when the sun is filling up the studio. There could be silence, there could be a old show playing in the background — as long as it is something I am completely familiar with. Having a sketchbook and project book on hand are both important. I’ll also have boxes and boxes of swatches lying around. But at the end of the day, believe it or not, the best ideas come during the most random moments. When you’re not working, what do you do in your downtime? What’s next for 7115 by Szeki? For the past 10 years garment is the sole focus of 7115 and it has been amazing, but there are other design disciplines that I enjoy practicing outside of 7115. In the coming years, I am planning on integrating other elements of my design world into 7115 and continue to bring high quality goods to our customer within the same principle that we have been running on. 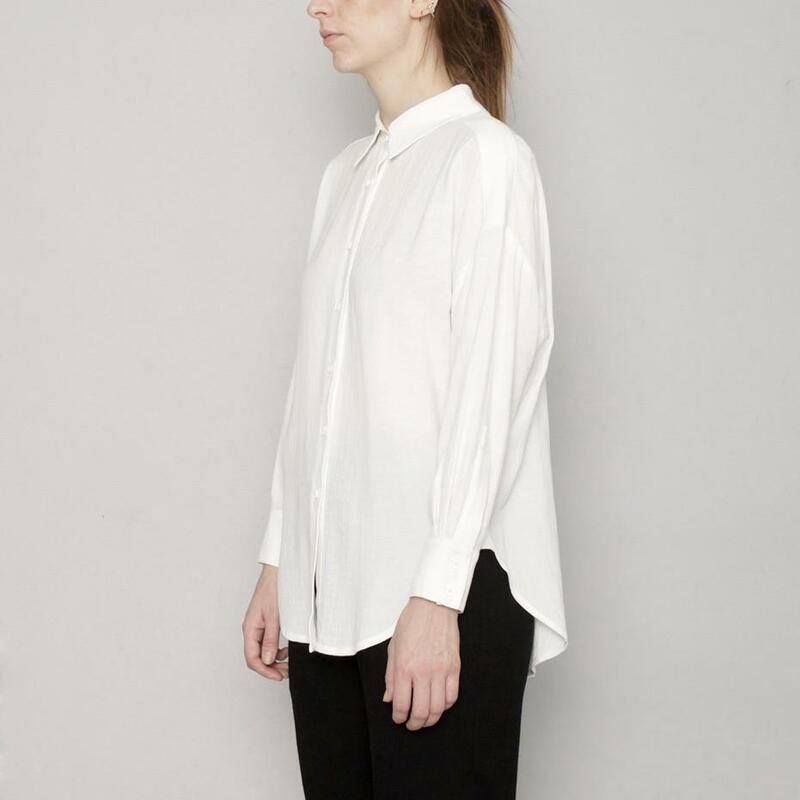 Deconstructed Blazer worn with Kowtow's Shore Relaxed Pant. My trusty FEIT court shoes. Last movie seen in a theater? Was it any good? Which MTA subway line do you love to hate? Last song sung in the shower? What are you going to do after you wrap this interview? Currently, what person, place, or thing are you most Infashuated? All the thank yous to Szeki Chan and Shirley Cai! Lookbook and studio shots courtesy of 7115 by Szeki. Check out their Signature Collection in-store on infashuated.com.